You are currently browsing articles tagged Regent Morton. Having a few days ago reviewed the death of John Knox, it is only fitting here to also review his burial. You might wonder what in the world is a post about a parking space doing in This Day in Presbyterian History? Well, if this author tells you that it is the final resting place of Scot Reformer John Knox, as seen in the photo of this post, you will understand. And yet we don’t really understand or comprehend it. All right, every church needs a parking lot. Every church needs space for its worshiper’s automobiles. But to pave over a portion of the church graveyard without moving the graves there, especially the grave of a former pastor of the church and Reformation leaders, namely John Knox, that is really crass, in this author’s opinion. But that is exactly what happened sometime in the 1970’s of the last century. It is interesting to this author that, despite searching, he has not found anything of the burial service itself other than these brief remarks around the grave. We in these United States usually have a funeral message, with Scripture being read, and other remarks of comfort and promises regarding the bodily resurrection of the Christian being buried. There are several monuments to John Knox in Edinburgh, one inside St. Giles Cathedral itself. Another one is standing in Geneva, Switzerland. In one sense, all of Scotland is a memorial to this great Reformer. whether they acknowledge it or not. 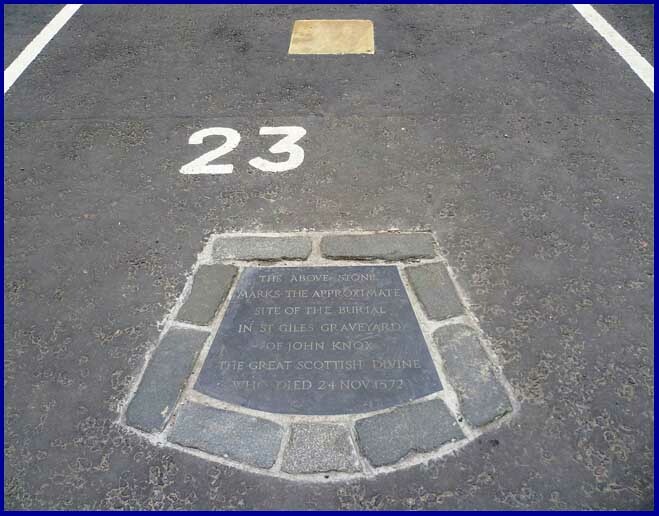 We who are the spiritual Presbyterian heritage of John Knox, have the hope and confidence that one day Parking Space number 23 will be emptied of its remains and John Knox will be reunited with his spirit already up in heaven. Come, Lord Jesus.